Live updates of the 2018 Rajasthan Assembly election results. Congress is hoping to oust CM Vasundhara Raje-led BJP government in the state. As the dust settles on the Congress celebrations, the post-mortem begins for the Bharatiya Janata Party (BJP). Several different factors are being blamed for BJP’s defeats in Rajasthan, Madhya Pradesh, and Chhattisgarh. Some are blaming the effect of the wane in Prime Minister Narendra Modi’s appeal while others are crediting a Rahul Gandhi-led resurgence. A Mint analysis suggests that both effects may have played a role in the assembly election results. National leaders have always played a prominent role in state elections—often holding rallies and public meetings in states to mobilize party workers, criticize the opposition and, ultimately, woo voters. In the two-month period before voting in three Hindi heartland states where BJP and the Congress were the main competitors, Narendra Modi attended 29 rallies covering 53 constituencies. Rahul Gandhi was even more active, speaking at 56 rallies covering 67 constituencies, data sourced from party statements and news reports show. When a rally has been held in the bordering town of a constituency, the analysis includes the bordering constituencies as having been covered by the respective leaders. Similarly, for rallies held in cities, all urban constituencies of the cities have been considered as being covered by the respective leaders. Modi and Gandhi’s paths also often crossed on their campaign trails: both Gandhi and Modi spoke at 24 constituencies. In these constituencies, Congress was more successful, winning 15 compared to BJP’s 9. The Congress was also able to register higher swings than the BJP in 23 of the 24 constituencies. In the 42 constituencies visited only by Rahul Gandhi, a little less than half elected the Congress, while in the 29 constituencies just visited by Modi, a third elected the BJP. However, seat victories could be a result of other factors beyond just the presence of a national leader. Often local or regional factors have a strong influence on assembly election results. Hence, a better approximation of rally influence would be to examine how vote-shares changed in constituencies compared to changes in district and regional averages. 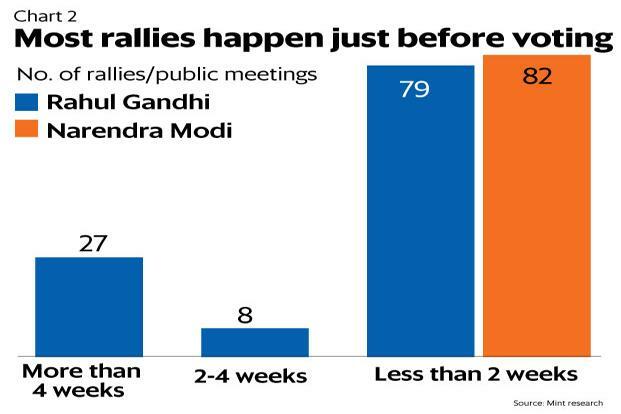 Based on this metric, Gandhi seems to have had a bigger impact in raising his party fortunes compared to Modi. In both Madhya Pradesh and Rajasthan, constituencies visited by Gandhi saw a higher swing compared to the regional averages. In Chhattisgarh, constituencies visited by Gandhi saw a relatively smaller vote swing. Gandhi’s relative success in boosting party fortunes is a significant change compared to Karnataka elections earlier this year. In stark contrast to Gandhi, Modi’s impact on constituencies he visited seems much weaker compared to the past. 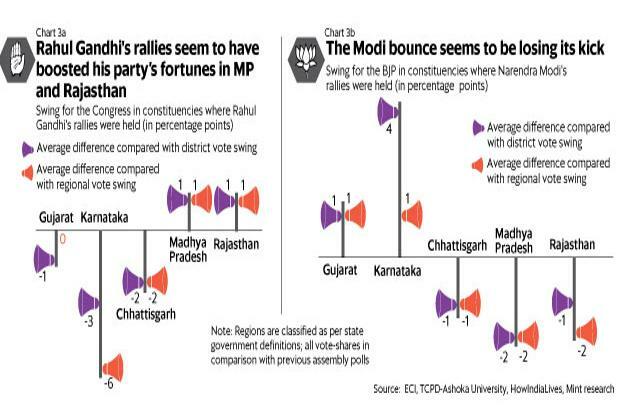 In both Gujarat and Karnataka elections, Modi had much greater success in boosting party fortunes, with constituencies visited by Modi witnessing higher vote swings compared to their regional counterparts. The Modi appeal may finally be weakening. Data from successive rounds of the Lokniti-CSDS Mood of the Nation surveys , also show that Modi’s popularity has waned over time although he still remains the most popular leader in the country. Modi was BJP’s trump card in the 2014 general elections and is likely to be so in the 2019 election campaign as well, but his impact is likely to be quite different from what it was five years ago.